Amy’s Treat – A Guest of The New England Patriots! 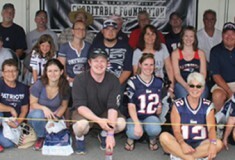 On Sunday, July 28th, The New England Patriots Charitable Foundation hosted a number of patients from the Seacoast Cancer Center and their guests to a Patriots Training Camp. Following the practice and much to the thrill of our participants, Tom Brady and company stopped over to sign autographs.